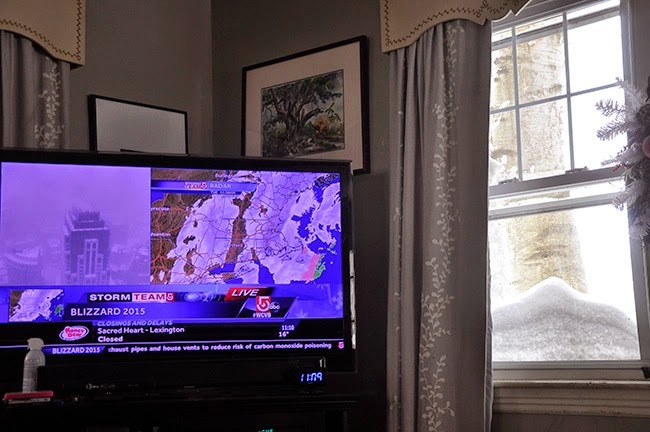 Unless you've been disconnected from the news lately, you've probably heard about our record breaking snowfall here in Worcester, MA. 35 inches according to the National Weather Service, but since they measure snow at a higher elevation here ( at our airport) we know that the depths were higher here in the valley where we live. My guess is that we received around 38 inches, with drifts up to….well, over our head in some spots (see the awesome video at the end of this post). Still, I love snow. Really. I do. It's so beautiful, but as I age, I am beginning to feel the effects of shoveling such record-breaking snow falls ( this storm broke our all time record for snow in a single storm here in Worcester). Today I am sore ( out-of-shape due to not working out, I know). 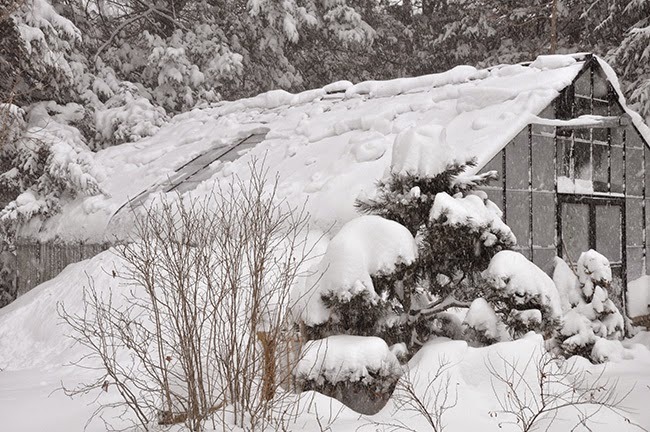 Here are a few images showing how the snow drifted higher than our first floor windows. When I come into the kitchen early in the morning, I could tell that I was in trouble. 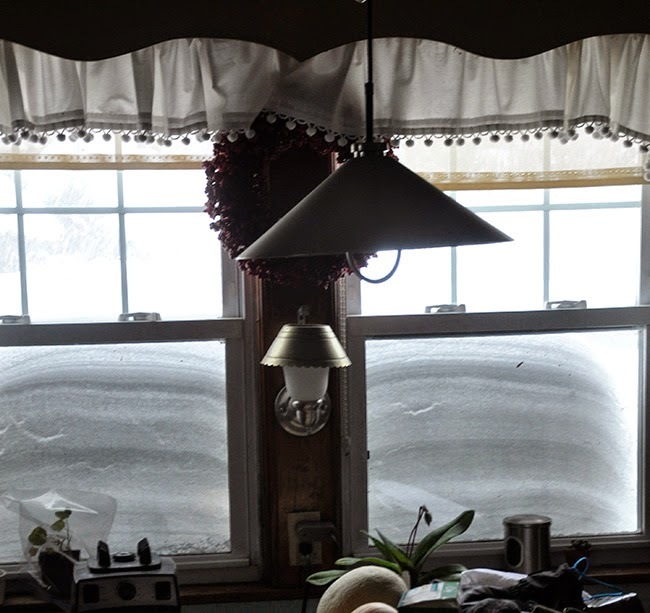 There is a deck outside this window which is on the windward side of the storm, but still, drifts or not, it was a heck of a lot of snow. First things first, I had to shovel a pee pee route for the kids. Ol Fergus still loves the snow. Liddy? Not so much. She still pee'd in the house to make a point out of all of this - she is the boss. 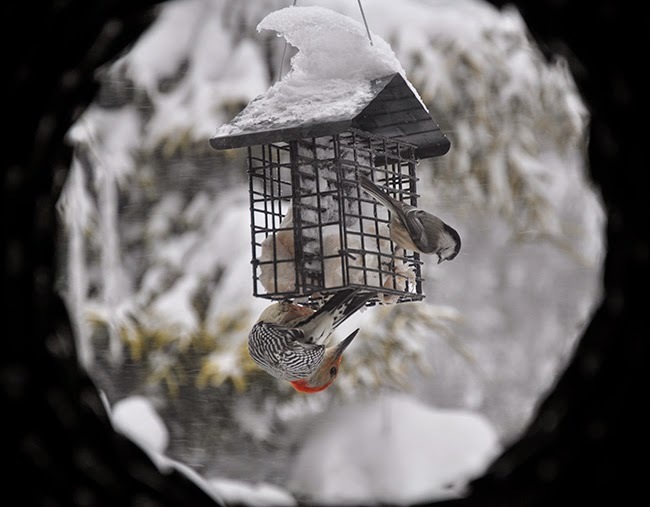 The bird feeders were packed, and as you can see here in this cool shot which I took from our kitchen sink through a Christmas wreath which helped hide me, a Red-Bellied Woodpecker and a Chicadee didn't mind sharing the suet. 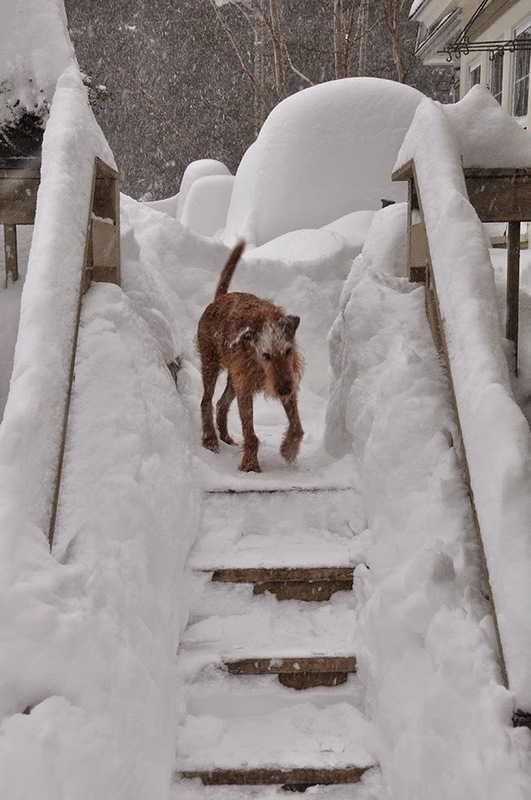 Fergie, having some second thoughts about attempting the stairs again - and this was early in the morning, we still had another 12 hours of snow coming. 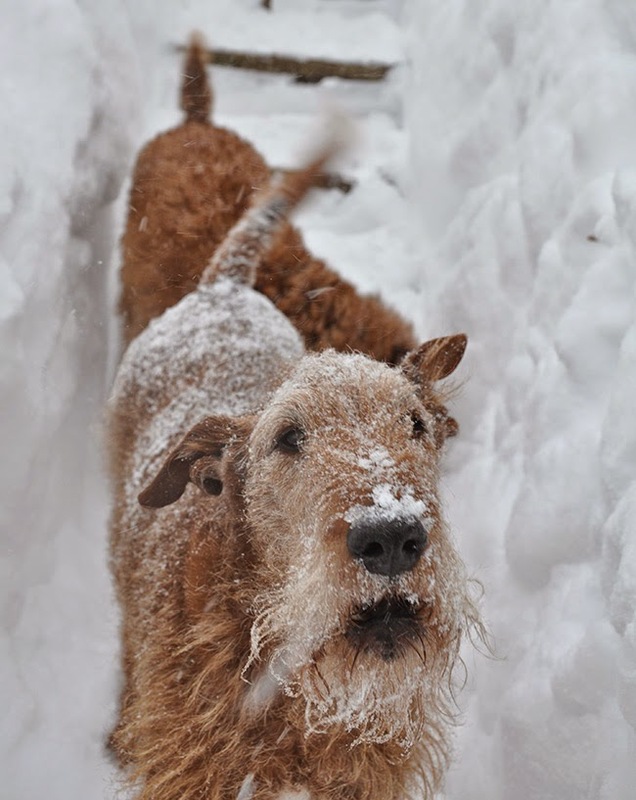 Doodles (Daphne), our youngest female Irish terrier, and the goofy sister of Weasley who is going to Westminster, loooooves the snow, but I think that she may have discovered that Avalanche rescue really isn't her thing. This might have been more than she bargained for ( truth be told, we tossed her in with the hopes of winning America's Funniest Video's, but after I saw that first clip, it just looked too mean, even though she had a ball. Doing again, three times until she decided that it was no longer fun. 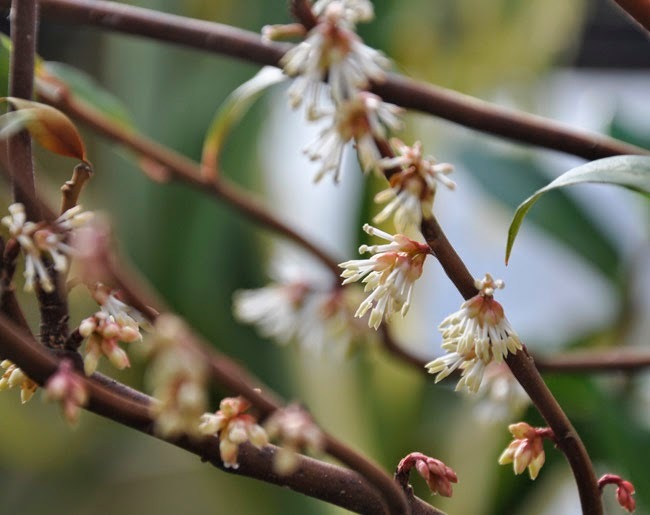 A FRAGRANT SARCOCOCCA HOOKERIANA BLOOMS IN THE GREENHOUSE - AN EARLY BLOOMER, THIS ZONE 7 SHRUB BLOOMS IN A COOL GREENHOUSE OR PORCH WITHOUT ANY ADDITIONAL CARE. 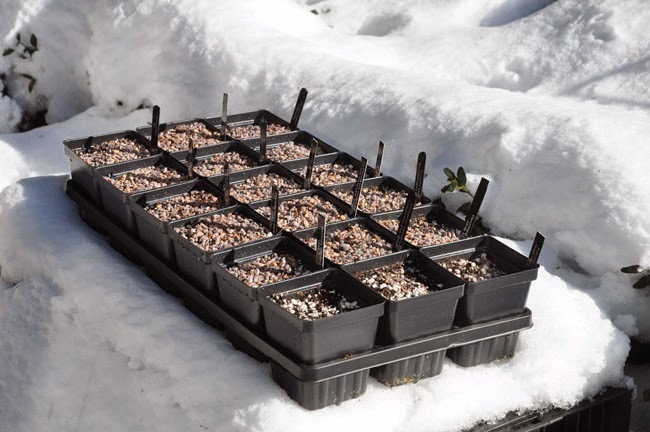 KNOWN AS THE HIMALAYAN SWEET BOX, IF I LIVED IN OREGON OR NORTH CAROLINA I COULD GROW THIS OUTDOORS, BUT IN NEW ENGLAND, IT MUST BE KEPT UNDER COLD GLASS. 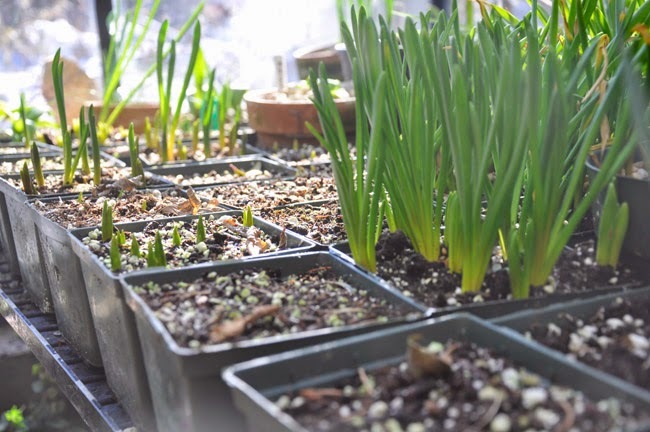 Timing is everything when it comes to forcing bulbs and plants for spring shows, and it only gets more complicated if one is trying to force multiple species or more unusual plants. So the next time you visit one of those big spring flower shows like Philadelphia or Seattle - pay attention to the type of plants being forced, as this is an indication of the growers skill. BULBOUS SMALL IRIS WILL FORCE QUICKLY, OFTEN WITHIN A FEW DAYS OF WARMTH, SO THESE POTS WILL GO BACK INTO COLD STORAGE UNTIL A WEEK OR SO BEFORE THE SHOW. With more and more landscape service companies using the spring flower show circuit to advertise their skills to clients and fewer greenhouses and nurseries forcing plants, the entire idea of what a spring flower show is changing to and event which is more about lawn and garden maintenance and landscape service, and less about true landscape design, horticulture and gardening knowledge. MY MUSCARI COLLECTION IS NOW READY TO FORCE, I HAVE MOVED ALL OF THE POTS ONTO A HIGHER BENCH. I THINK THAT I WILL HAVE TO MOVE THEM INDOORS TO PUSH THEM ALONG LATER, BUT FOR NOW, THEY SIT IN THE SUNSHINE. I HOPE THE DIFFERENT VARIETIES WILL END UP BLOOMING TOGETHER. We can all grumble about the good old days of flower shows, but the reasons why these shows have evolved in such a commercial venture revolve more around the practical reasons of cost and economics (ROI) than it does about anything else. I get it. I don't like it, but I get it. HYACINTHS ARE EASIER TO FORCE, BUT THESE TOO ARE ALMOST TOO BIG FOR FORCING THIS EARLY IF I WANT THEM IN BLOOM FOR LATE FEBRUARY, SO I AM KEEPING THEM COOLER UNTIL NEXT WEEKEND. If you see lots of Forsythia, mauve PJM rhody's and lots of greenhouse grown azalea plants along with tulips, daffodils and supermarket primroses all swimming in yards and yards of yards wood mulch it means that very little effort into planning and even less skill was needed in forcing the plants. Don't get me wrong, I understand the economics of managing such an immense display with fancy forced deciduous trees and carefully forced woodland plants with drifts of unusual bulbs, but these days are gone, I'm afraid. 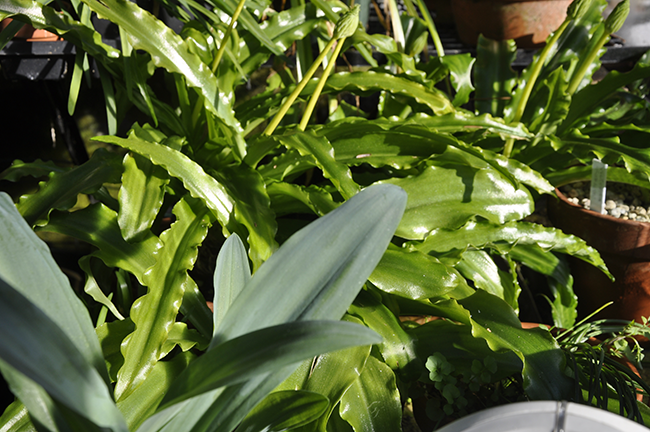 THE LILY OF THE VALLEY ARE READY TO FORCE, WITH THEIR BUDS OR PIPS POKING OUT FROM THE SOIL. As I plan for my exhibit at a flower show this February, I fear that my display will not be terribly interesting, but I too am learning - for there was a time when the bar was quite high at the great Eastern spring flower shows. Directors of horticulture from Holland would sometimes orchestrate the entire process here at our local exhibit at the Worcester County Horticultural Society show, but today, only a few of us have greenhouses, and even few have the means. THE ENTIRE PAD OR SOD OF LILY OF THE VALLEY IS SET INTO A GRAPE CRATE FROM THE MARKET, AND WATERED WELL, SET INTO THE SUNSHINE ON A BENCH WHERE IT IS STILL COOL. NEXT WEEK, IT WILL BE BROUGHT INTO THE WARM HOUSE UNDER LIGHTS. In an effort to reinvent the idea of the great spring flower shows, I've helped inspire the now reinvented Worcester County Horticultural Society which is now Tower Hill Botanic Garden to attempt reintroducing a spring show. I expect that this show will start off small, but hopefully it will generate a new way to experience the magic of spring a few months earlier, without the lawn mower companies and hot dog booths. 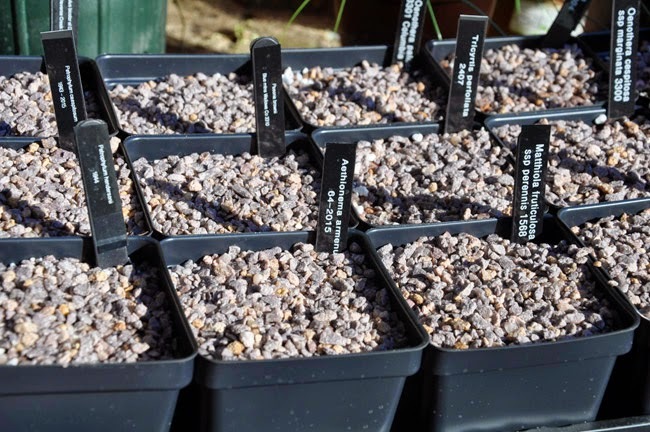 WHILE I'M AT IT, MY SEEDS FROM NARGS (NORTH AMERICAN ROCK GARDEN SOCIETY) ARE SET OUT INTO THE SNOW TO BE EXPOSED TO WINTER WEATHER FOR A MONTH OR TWO. I WILL COVER THESE WITH A FLAT TO PROTECT THEM A BIT FROM BIRDS. If you live in the New England area, consider forcing a few branches of most anything, and enter a class at the Spring Flower Show Flora in February. Success will come when a number of people become involved. And if you cannot enter this year, start thinking about next year. Start a collection potted plants that might be entered in a Potted Plant Display next February. SOME OF MY NARGS SEED READY TO CHILL AFTER BEING KEPT WARM FOR 2 WEEKS. 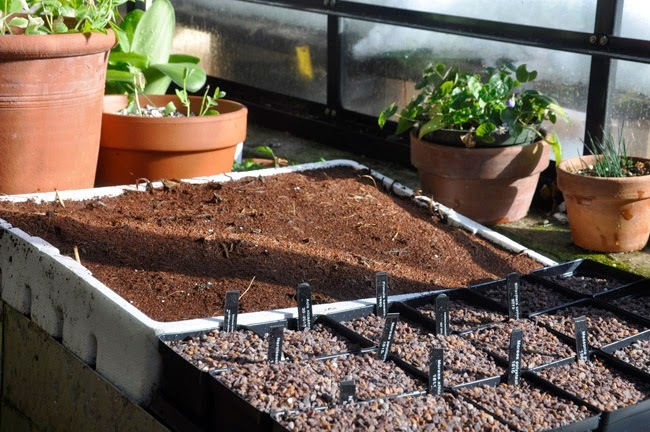 THIS IS NECESSARY FOR MANY WILD SEED WHICH NEEDS A COLD PERIOD FOLLOWING A WARM, DAMP PERIOD IN TO STRATIFY PROPERLY. WE HAD A BIT OF SNOW SATURDAY, ALTHOUGH WE ARE GETTING READY FOR A BLIZZARD WHICH IS SET TO HIT THE NORTH EAST TOMORROW. Think about bulbs that you can pot up in the fall to force, or plant interesting and rare shrubs in pots to force - it's fun and the more who participate, the better the shows int he future will be. At the very least, pay a visit to Tower Hill and support this effort. There is nothing like a flower show to raise ones spirits when there is still snow on the ground. 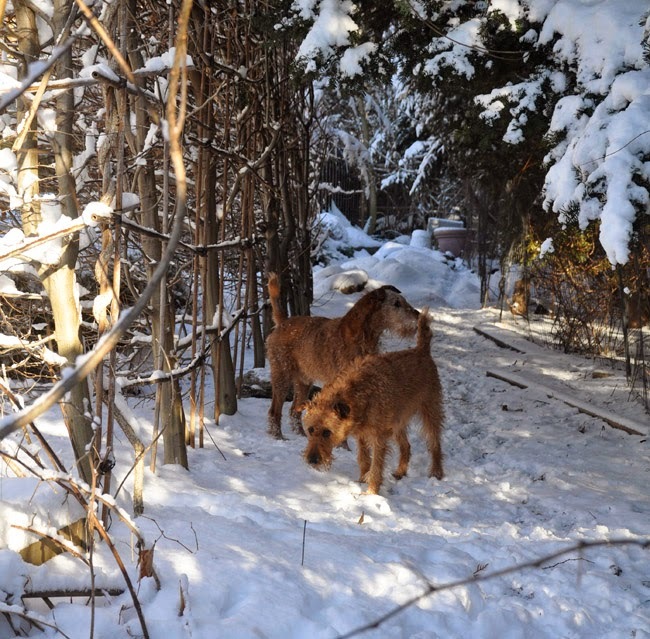 FERGUS AND LYDIA ENJOY THE SNOW. 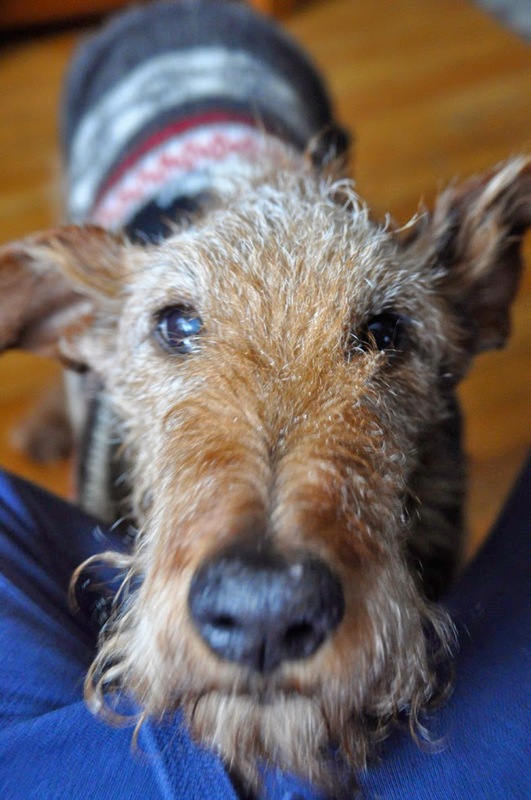 FERGUS IS DOING WELL WITH HIS CANCER, THE STEROIDS ALLOW HIM TO BE PEPPY AND PUPPY-LIKE FOR NOW, BUT WE EXPECT THAT THE INEVITABLE WILL HAPPEN QUICKLY. ONE DAY AT A TIME. LIDDY IS PREGNANT, SO WITH BOTH HAPPENING AT THE SAME TIME, IT'S A LITTLE CRAZY AROUND HERE - OF COURSE, WITH WEASLEY GOING TO WESTMINSTER, IT'S CRAZY. 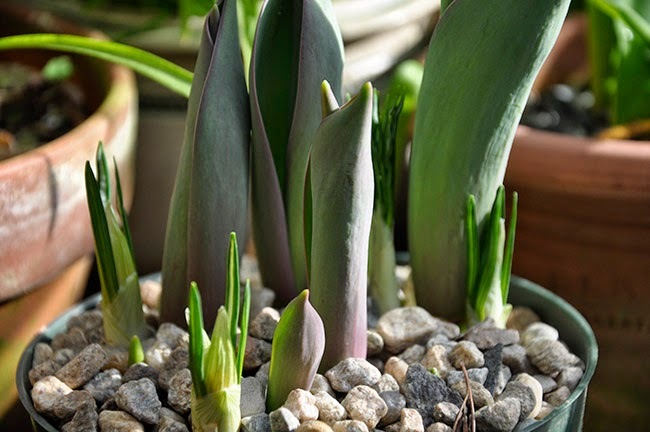 For most people, the easiest plants to force are indeed the Dutch bulbs which we all know - starting with crocus which are the easiest and then the smaller bulbous Iris, and followed with hyacinths and the smaller narcissus. 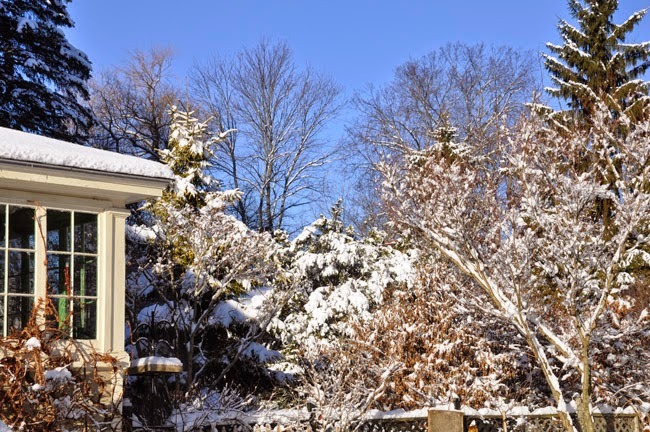 Most just require 15 weeks of cold with temps around 40º and then a gradual warm-up either under lights or on a cool, sunny heated porch or windowsill. 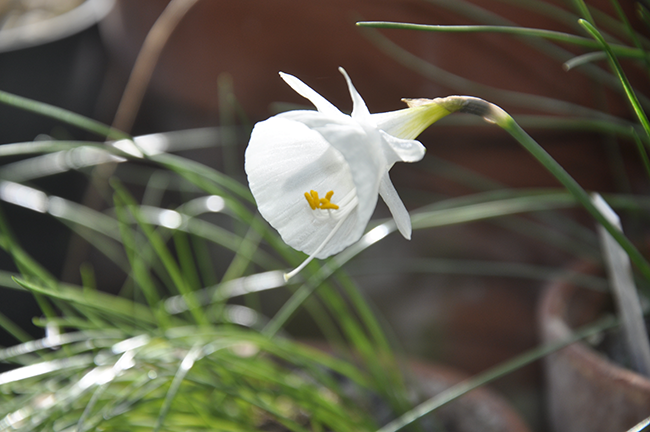 Larger narcissus are easy too, but need more chilling time. Tulips and the lesser bulbs can be more challenging and that's where I am currently struggling as I am preparing for a spring flower show which is being held at the Tower Hill Botanic Garden at the end of February, and this whole forcing thing is causing some stress - as it is difficult to find accurate cultural information in regards to dates and forcing times. I once had a nice commercial book on ornamental horticulture from college which covered forcing times for everything from greenhouse crops of anemones to Easter Lilies, but trying such information on-line is challenging - thanks to bloggers (like myself!). 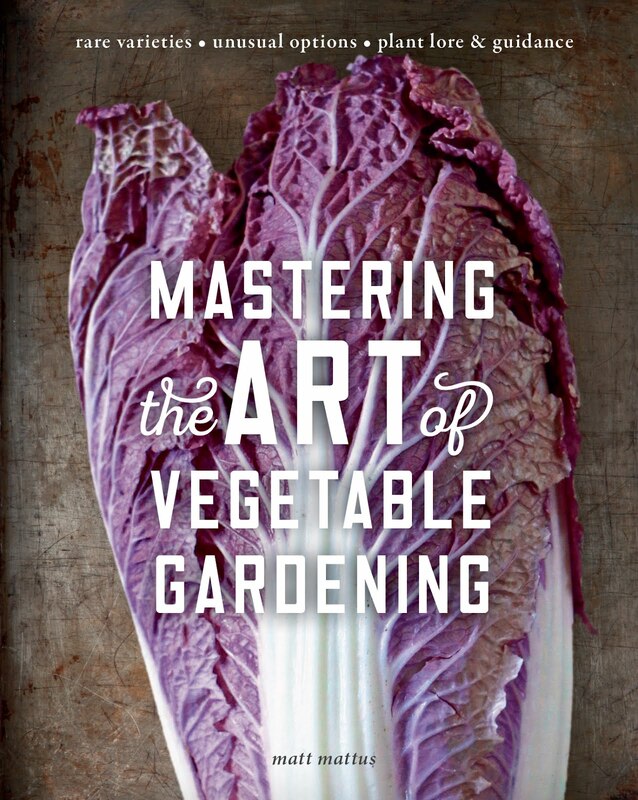 I too need to be careful when researching cultural information, weeding through the second hand or shared information, I generally rely on commercial sites or even old books from the 1800's, as these often provide advice for cold greenhouses such as mine. THANKS TO EVERYONE FOR THE KIND WORDS AND SUPPORT FOR POOR FERG. HE'S GRATEFULL FOR ALL OF HIS FANS OVER THE YEARS WHO HAVE SENT THEIR THOUGHTS. Still, I know that it will take some orchestration as I begin to force my bulbs, not that it is difficult to force any of them, but trying to time them so that they will all be near peak bloom for a specific date will require me hauling them from the cool storage to sunny and cool benches in the sunshine, and then probably up to a warm bedroom under lights, and then back to the cool greenhouse, perhaps setting them on the even colder floor to hold some back, while providing others a higher bench so that they can color-up in the mid-February sunshine - and so, the dance begins. 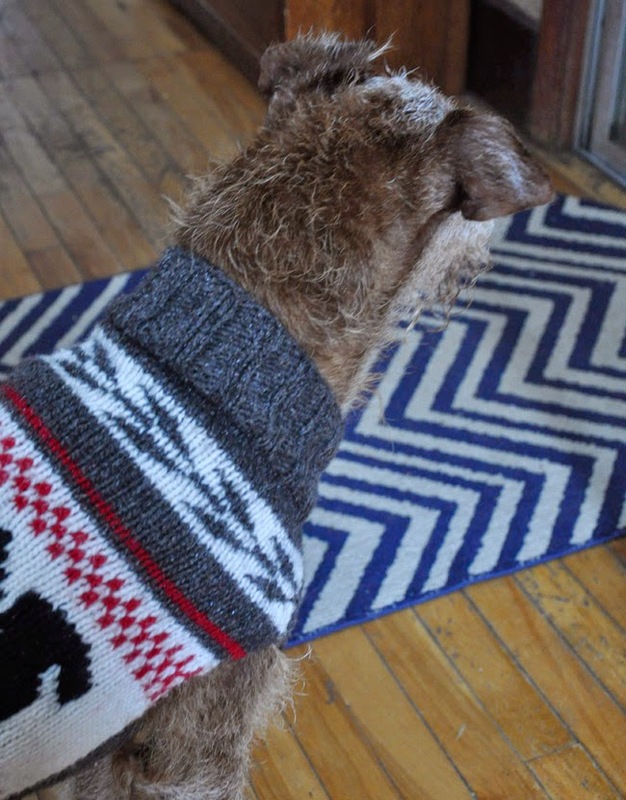 ...AND HE LOVES HIS NEW SQUIRREL SKI SWEATER. THE OL BOY. 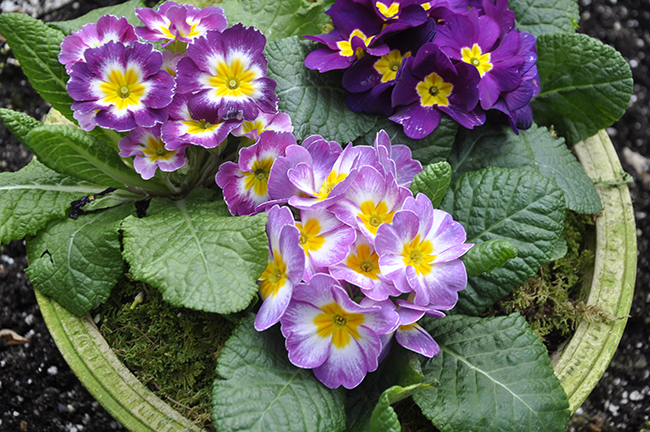 REGULAR SUPERMARKET PRIMROSES CAN LOOK MORE INTERESTING IF CAREFULLY CURATED SO THAT ONE HAS NICER COLORS, AND WHEN POTTED UP IN A NICE HUY WOLFF POT THEY CAN SHINE! Here it is -mid January and the temperatures outside are dipping down below 0º F, but this weather doesn't seem to be stopping some of the tropical plants which are spending the colder month of the winter in the house, since even the greenhouse is too cold for them. This weekend we hosted the New England Primula Society for a lunch and greenhouse garden tour as they are planning the national primrose exhibition which they are hosting this year at Tower Hill Botanic Garden in Boylston, MA in May. I was too busy to take photos this year but we had about 40 guests including folks from Blythewold Mansion, Gardens & Arboretum, author and garden designer Kris Fenderson and many cross-over NARGS friends like Ellen Hornig, Elizabeth Zander and plantswomen Amy Olmsted.). I am always surprised at how far people drive here with many coming from New York State, Vermont, New Hampshire, Maine and Rhode Island. I tried to keep it easy on myself so that I could enjoy some of the meeting, which lasts most of the day beginning at 11:00 am. I made grilled cheese sandwiches with fancy cheeses, a sorrel, lemon, and golden beet salad and tomato soup. When we were cleaning up after our meeting Joe pointed out that one of our large Alocasia macrorrhizos 'Borneo Giant' plants which sits in the corner of the studio had ripe seed which somehow we missed - probably because the leaves are still larger than we are, reaching a height of 10 feet or so. The seeds, which are berry-like and dark orange ( they should be red). Even though they are almost ripe, I am going to sow them as in the past, we've even had green seed germinate. 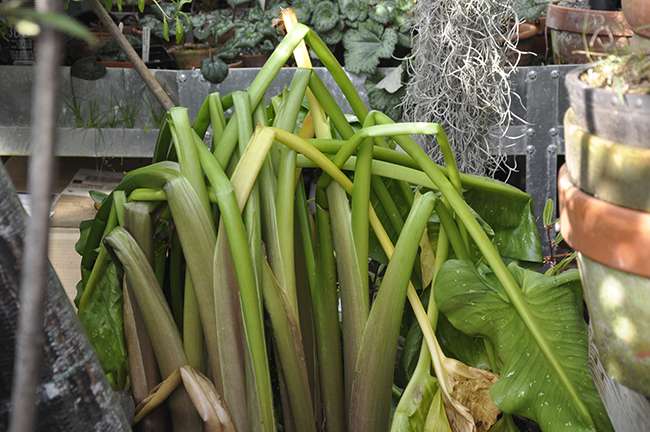 If you brought an Alocasia indoors this autumn, you too may find one of these 'pod's. 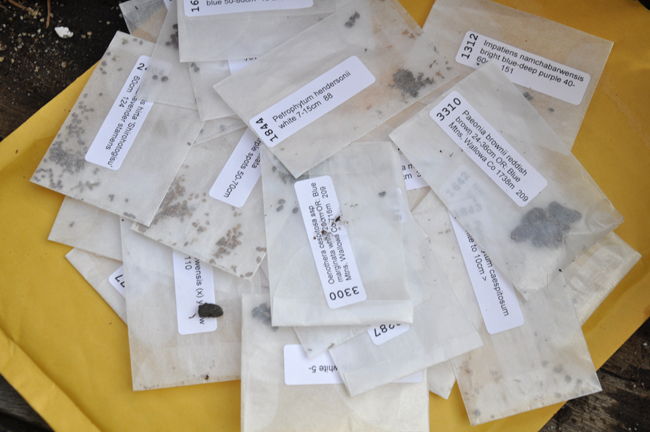 Here is how I treat such seeds - but note, this is not a strict, scientific method, and I am not an aroid collector (even though I do grow a few), but the seeds on many aroids are treated similarly. 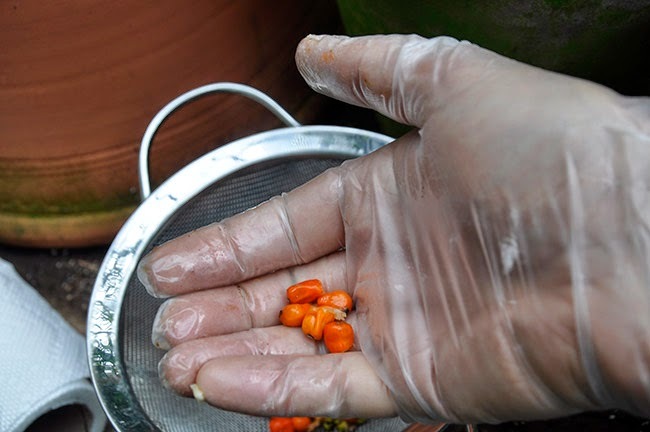 When ripe, the 'pods' split open and curl downwards revealing the white, light green or bright, red fruits which look like 'berries' but they are toxic so do not eat them and it is recommended to handle them with latex gloves as the flesh can irritate bare skin. 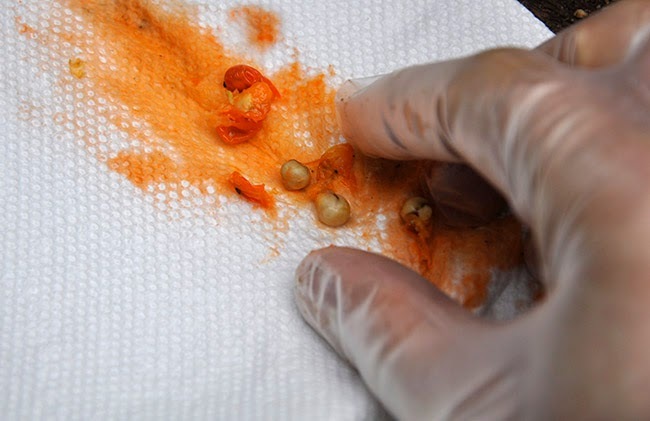 The fruits must be cleaned before sowing, which is a simple task - smearing them across a few paper towels will do the trick. Some growers soak the clean seed overnight, others rinse them off in a sieve, but neither is necessary, and one could simply sow them in good, professional soil mix which is what I did. 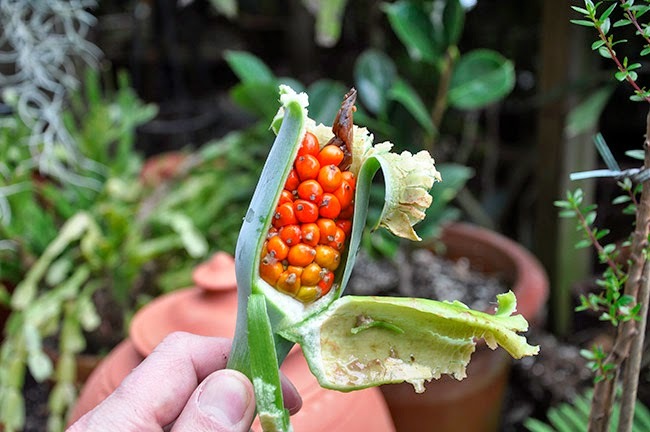 My seed is not completely ripe, as the fruit is not deep red, but I have had seed germinate throughout the greenhouse in past years, so I am hopeful that this almost-ripe seed will germinate. 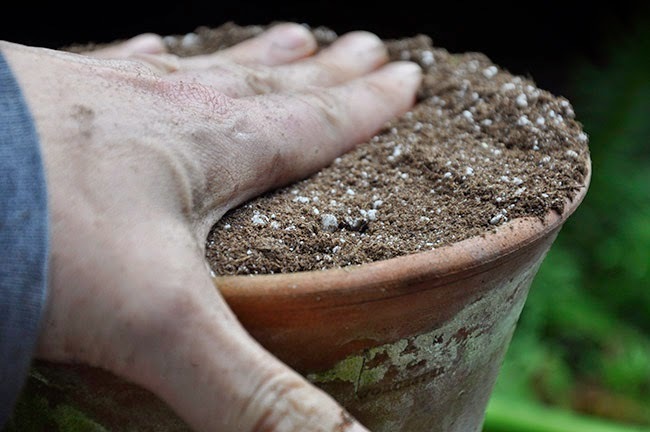 Most aroid seed if tropical, require warm temperatures in which to germinate well, and most aroid collector sites recommend soil temperatures no lower than 70º F and no higher than 85º F. Because of this, I am keeping my pot of seed indoors for a while. We keep many selections of Alocasia so I am curious if any of them have crossed with this plant ( I am not even sure if the plants are pollinated via beetles, insects or wind! I am being a bit lazy botanically, I admit.). I am rather certain that any offspring will not truly be Alocasia 'Borneo Giant', perhaps I can label them ex. 'Borneo Giant'? Yes, that would be safest and the most proper way to label these seeds. My Alocasia seed is spread about in one of my clay pots ( I know, it's a bit dirty and unwashed). 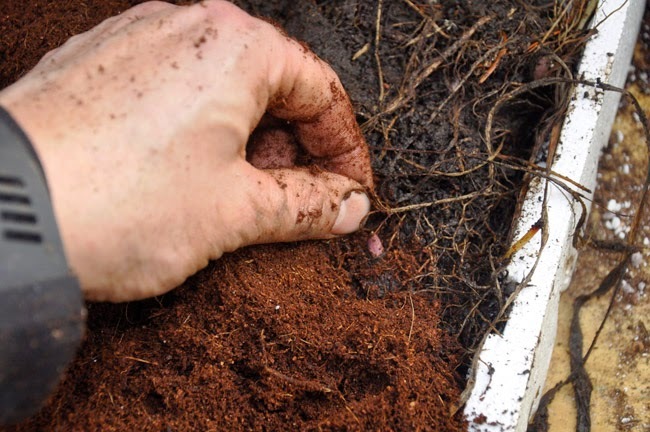 A layer of fresh soil is added to the top so that the seeds are set a depth of about 1/4 inch. 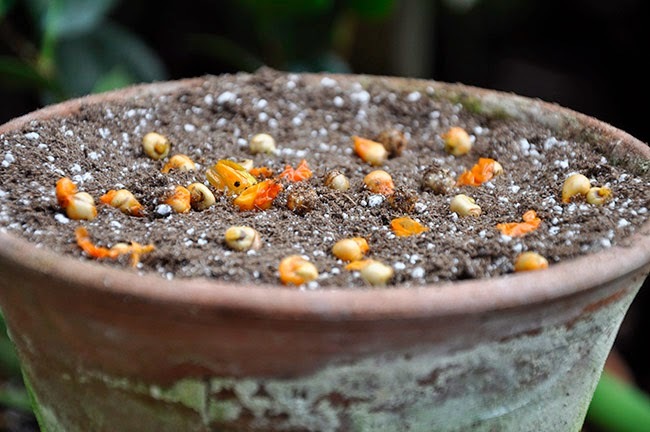 The soil is tamped down with hardly any fuss, as I have Alocasia seed popping up in pots all over the greenhouse, so I am expecting that at least a few seeds will germinate for me. The rare double sterile nasturtium named 'Margaret Long' is treasured by those who know about such things. It can only be propagated by cuttings,never from seed, is so much more than a mere 'hand-me-down plant - a sport off of a double red Victorian plant named 'Hermine Grashof' , a similar form that dates back to the 1880's, this apricot sport appeared on a plant in Ireland in the early 1970's, and had been passed on since then. Such double sports where treasured as pot plants and remain terribly rare. I am so excited to tell you that I finally have this Nasturtium in my collection!!! I don't use explaimation points that often, so I suppose that you can tell that I am truly excited. I have been on a hunt for it ever since I first read about it (I wrote about it here). As such things go, plant folk are of a good and generous soul, and thanks to a few people (mainly Gail Read, the garden manager from Blythewold and Kathy Tracey at Avant Gardens - I hear, who passed it on to Gail for safe keeping in their greenhouses until Gail could get it up to me. Really-- What a dedicated bunch of plant people!). Please don't' ask them for one, as I know they don't have any to share, but apparently Avant gardens does carry it from time to time, as does Annie's Annuals, but currently, they are not propagating it. I am so grateful and of course, delighted. More on these rare nasturtiums soon! First, I am off to make some cuttings. 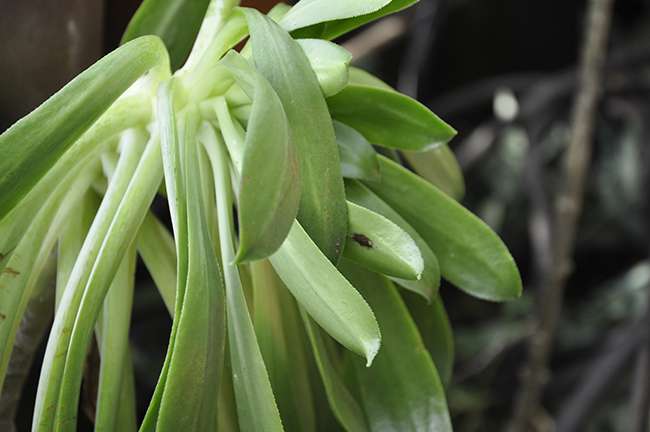 Can you guess what this plant is - - It's a Cymbium elegant ( see photo of it at the end of this post- it's terrific!). 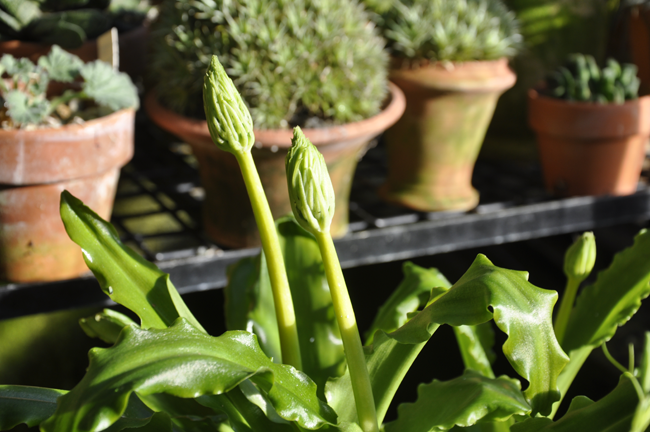 I noticed it in bloom while relocating pots of bulbs in the greenhouse so that I can force them for an upcoming flower show in February - will I have enough time to force 100 pots? I am so eager for spring to arrive now, (maybe because it is not really snowing this year), or perhaps it's just because of last week's fridgid record breaking cold blast - regardless of why, I thought for some reason that my spring bulbs should come out and be forced, after all, Iv'e often had luck forcing the smaller Iris reticulate and crocus species just after the New Year. 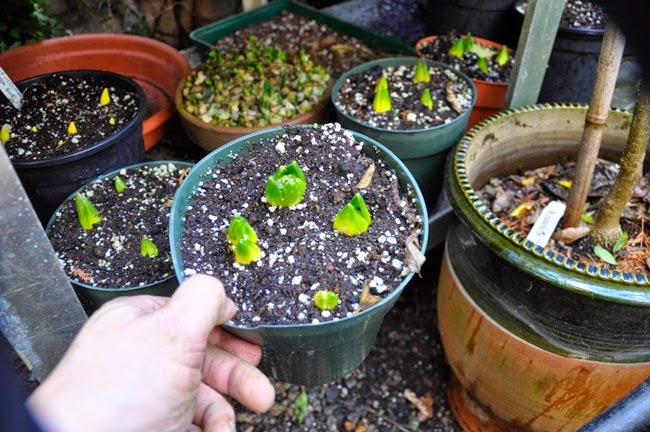 After checking on my pots of bulbs (which have been chilling in cold storage under the benches), I was encouraged, as I could see that some were beginning to emerge - those little green noses poking through the soil which looked so hopeful that I relocated most of my bulbs which were potted on October 11, 2014 and allowed to root slowly throughout autumn until being placed in total darkness and cold temperatures until now (40º or less)- it all seemed to be going so well - until I did some homework. Counting the weeks from when I planted them I realized that I had made a common and grave mistake - I took my bulbs out of cold storage three weeks too early. I SET MY BULBS WHICH HAVE BEEN CHILLING SINCE OCTOBER OUT ONTO A BENCH TO FORCE. THEY LOOK HEALTHY, BUT I LATER DISCOVERED THAT I AM FAR TOO EARLY TO START FORCING MOST OF THEM. So back they went into the cold darkness for a few more weeks until I remove them to warmer temperatures (gradually, so that they adjust) around January 26th. 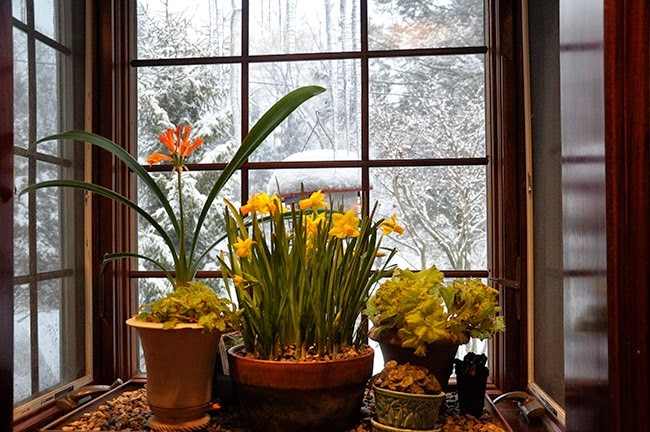 You see, most hardy bulbs require at least 14-16 weeks of cold temperatures, just above freezing so that they will force well. Sure, I could have removed these bulbs now, and many would have bloomed eventually, but much can go wrong, depending on the species and selection. 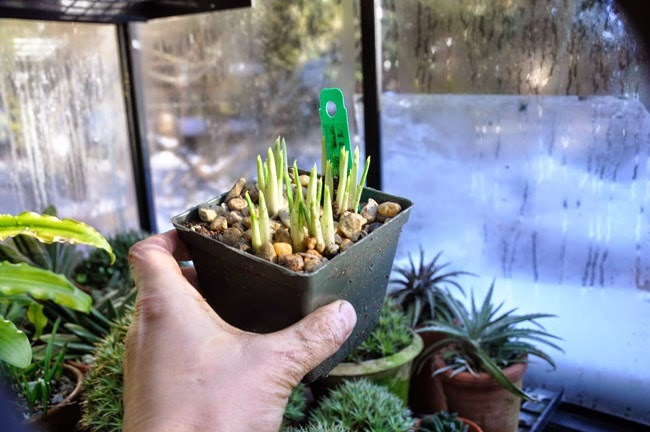 Hyacynths are more forgiving, as are crocus, but the larger narcissus could actually talk longer to force when removed prematurely, as I discovered in the past, pots removed in early January sprouted, but the pots removed around February 6 caught-up and the surpassed the earlier bulbs blooming two weeks sooner in the end. Tulips are notoriously fussy about forcing, with the early tulips and Darwins being a little more well behaved than the late varieties which I just don't bother with at all, I never remove tulips until 16 or 17 weeks in cold storage. Much can go wrong with their flower buds not extending far enough out beyond the foliage, and many will just abort if forced too quickly. Once removed from cold storage, potted bulbs must be careful coaxed into believing that it is truly spring, so although they will need to be forced into full splendor indoors ( under lights) for my needs, where it is a balmy 68º F., they must first be gradually introduced to moderate temperatures in the cold greenhouse (or if you are forcing in your house, the coolest spot you can find). 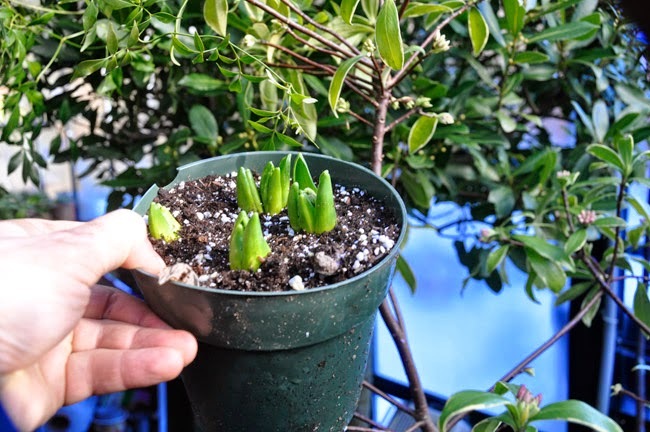 Pots of many bulbs when removed to force for a spring flower show or display should bloom quickly, in 2 -3 weeks. If it takes longer, then you removed them too quickly. TULIPS ARE MORE DIFFICULT TO FORCE WELL, THEY DO BEST WITH MORE THAN 16 WEEKS OF COLD TEMPS IF YOU CAN DO IT. AN UPCOMING GARDEN PARTY IN JANUARY? YES! Joe and I are hosting the American Primrose Society next Saturday - it's our annual Primula Society Winter Luncheon Bash, which of course, will includes walks through the greenhouse and lots of plant chat, as this fabulous group of friends and plant professionals and enthusiasts are essential all plant geeks. 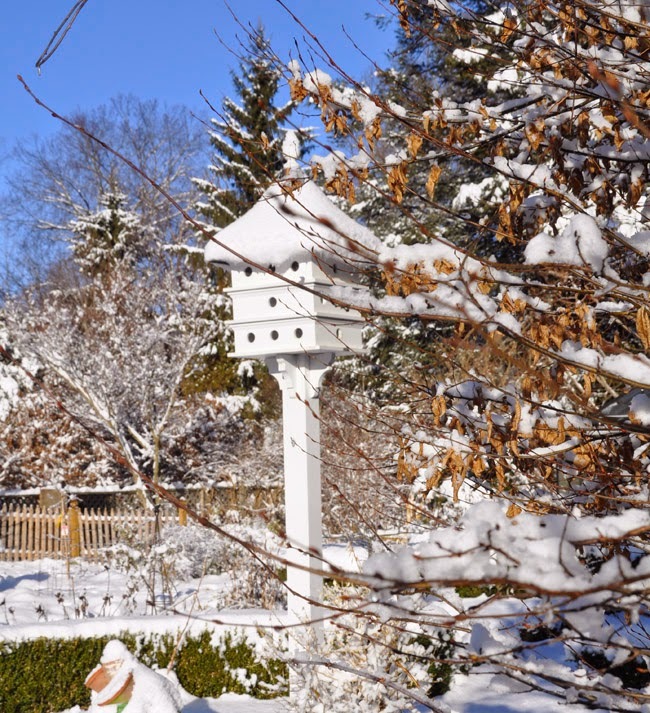 There is nothing like a little garden tour in the middle of winter we discovered. Snow, hearty ski-lodge type food, and then our meeting to plant the spring Primrose show. It's always so popular that it seems that we get more and more people ( and new members) every year. I AM FORCING A COLLECTION OF MUSCARI, EVERY SPECIES AND SELECTION THAT I COULD FIND - NEARLY 25. MUSCARI, or GRAPE HYACINTHS PRODUCE FOLIAGE EARLY, SOMETIMES EVEN EMERGING IN THE AUTUMN WHEN OUT IN THE GARDEN. BUT NOW, I HAVE RELOCATED ALL POTS BACK INTO THE COLD. THESE HYACINTHS MIGHT HAVE BEEN OK, BUT MOST BULBS ARE NOT YET READY TO FORCE, NEEDING AT LEAST 3 MORE WEEKS. WHEN READY, THEY WILL ONLY NEED ONLY 2-3 WEEKS OF TEMPERATURES AT AROUND 68º F TO FORCE, AND TIMING IS EVERYTHING SINCE I NEED THEN BUDDED BY FEB. 20. You may be wondering why I am attempting to force so many bulbs? I am planning to set a display at the new Spring Flower Show at the Tower Hill Botanic Garden and I need enough to fill a 12 foot table (we'll see how that goes! 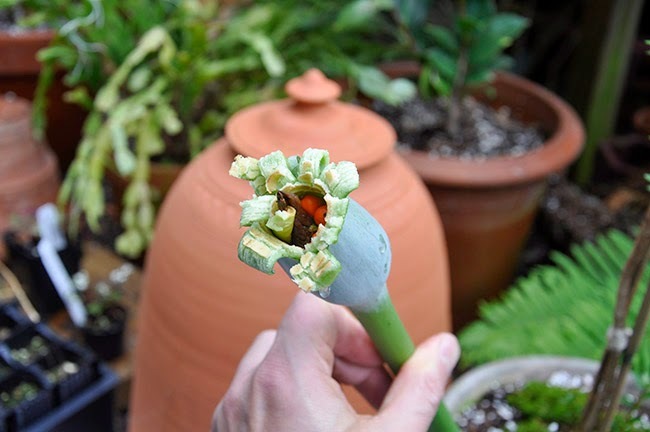 So much can go wrong when trying to time bulbs to be blooming on a specific day!). 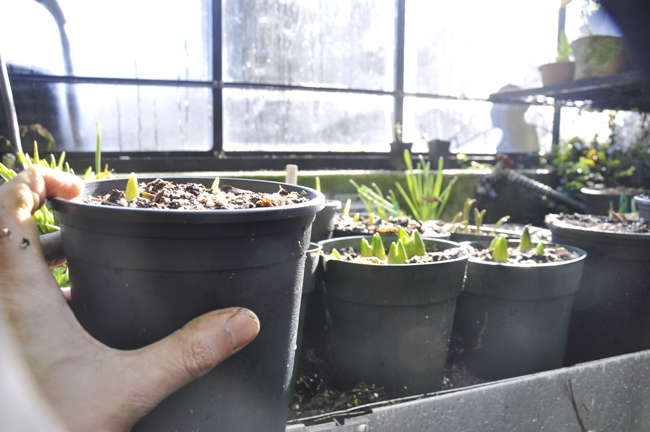 I almost screwed it all up by removing those which were teasing me with their early emergence - so tempted to force just a couple of Iris reticulate for myself, but nah…..I need them all as surely I will mess up when I do try to force everything for a particular date. I ONLY LOST A FEW PLANTS WITH OUT FREEZE THIS WEEK, MOST OF THEM PELARGONIUMS OR GERANIUMS, BUT A FEW SURVIVED, SOME, EVEN IN BLOOM. Timing what you force so that it will bloom on a particular date is a real skill few have. I remember working at the old Worcester County Horticultural Society back when I was in High School where we used to also set up a display in my horticulture class, our instructor would take us to local greenhouses and large nurseries who were also forcing full sized trees and shrubs for the New England Flower Show which was held in Boston around the same time. Many of these nurseries would be forcing trees and landscape material along with perennials and bulbs in different greenhouses. I would watch them move pots from warm bottom heated benched which sped them along, to chilly spaces near the glass or on the floor to hold them back. I WAS A LITTLE SAD TO SEE THAT THIS BUDDLEA ASIATICA FROZE, AS IT USUALLY PROVIDES FRAGRANT FLOWERS THROUGH THE COLDEST MONTHS, BUT I BELIEVE THAT THE TRUNK IS STILL GREEN. THIS PLANT IS PLANTED IN THE GROUND. 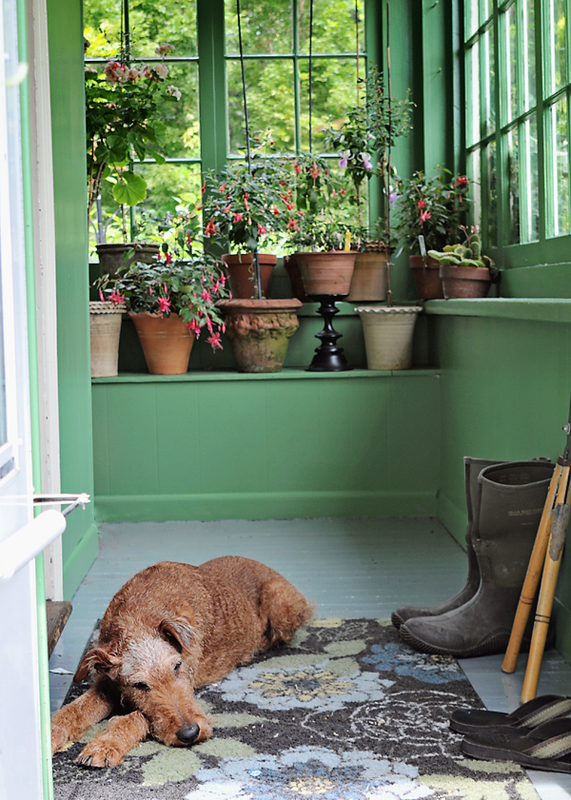 Other forcing tricks included constructing plastic tents around benches that had rhododendrons and azaleas on them, to keep the inside warmer, and to provide more humidity so that their thick buds would open. PJM and Rhododendrons were easier than let's say lilacs or Dog Wood trees, the real skill awards went to the few specialist nurseries with the talent and skill to force an elm tree which was 24 feet tall into full bloom, or a magnolia species. Larger trees were common then in such displays, as were lawns which were forced and then cut with lawnmowers, and unusual perennials. Points were taken off if one only created a display with the easiest plants to force - forsythia, small azalea and rhododendrons - and then the gaps filled in with commercial greenhouse stock such as florist azaleas, primroses and then more mulch than you can imagine. Today, sadly, this defines most of what one sees at Spring Flower Shows - more 'Lawn and Garden" shows than about the art of forcing unusual and interesting specimens. Yes, it was costly, sure, the audience probably doesn't know the difference, but somehow, I feel that we lost something. THE VELTEIMIA BRACTEATA 'LEMON FLAME' WHICH WERE FROZEN HAVE BOUNCED BACK WITH LITTLE TO NO HARM. EVEN THE BUDS LOOK LIKE THEY SURVIVED. 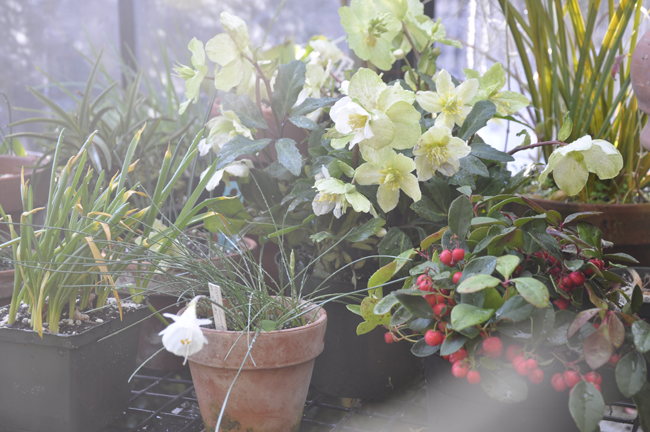 HOLIDAY PLANTS HAVE BEEN MOVED BACK INTO THE GREENHOUSE WHERE THEY CAN ENJOY THE DAMP, COOL CONDITIONS. 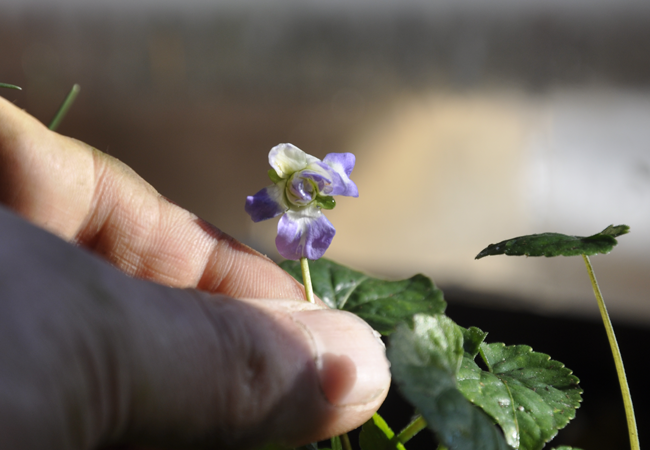 EVEN A SINGLE VIOLA ODORATA CAN SCENT THE GREENHOUSE LIKE VIOLETS. I ALWAYS ASSOCIATE THIS UNIQUE SCENT WITH WINTER GREENHOUSES. AND LOOK WHAT ARRIVED IN THE MAIL TODAY - MY NARGS SEED ORDER. ONE OF THE FINEST BENEFITS OF BEING A MEMBER OF THE NORTH AMERICAN ROCK GARDEN SOCIETY. TWENTY FIVE CHOICES IN THE FIRST ROUND, AND THEN THERE IS A SECOND ROUND - WITH MANY WILD COLLECTED SEEDS FOUND NO WHERE ELSE. 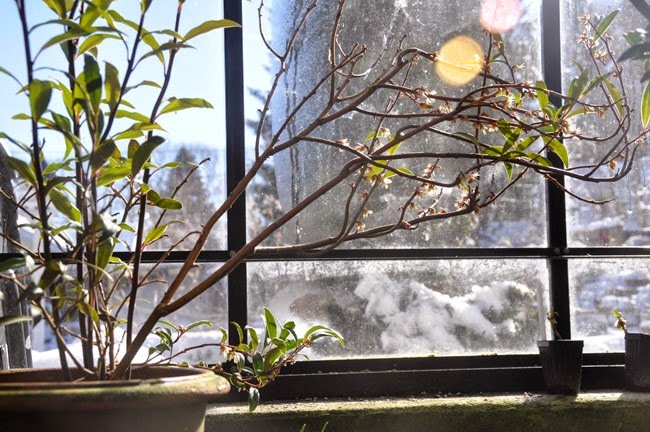 Thankfully, we are having a sunny break here in New England, and even though the temperature outside the greenhouse remains below 20º F, inside, the sunshine warms the air near 70º. Spending a day working in a greenhouse in January is something one can hardly complain about - the scent of soil, the simple joy of turning on a hose and getting a little wet, the moist, cool air and the sweet fragrance of whatever is in bloom offers a contrast so rare when the air outside is essentially dry and hostile. After the big freeze and associated drama this week, I spend a few hours rearranging plants and repositioning some benches which had to be moved for the workmen, when I discovered a surprise - a beautiful Cymbidium elegans in bloom. This, made my day! Cymbidium elegans is a species more likely found is the collection of a serious orchid grower than at a retail store, as it is not easy to find ( Santa Barbara Orchid Estate has a few, and it's where I purchased mine a couple of years ago - this is the first time it has bloomed.). Unlike most Cymbidium species, this one, which comes from Northern India, Nepal and Bhutan, has blossoms with a unique form, as they don't open completely. 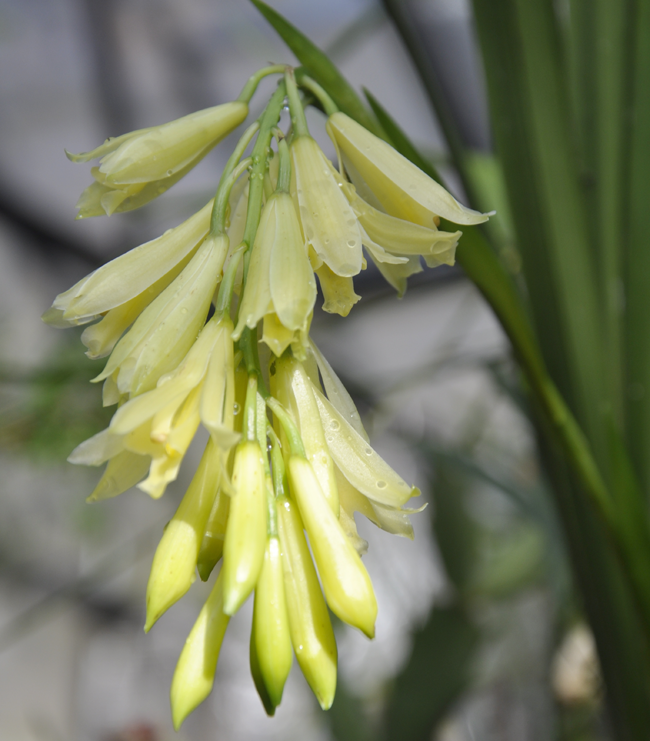 They look like lemon colored bells, appearing more like a limp tuberose stem than an orchid. 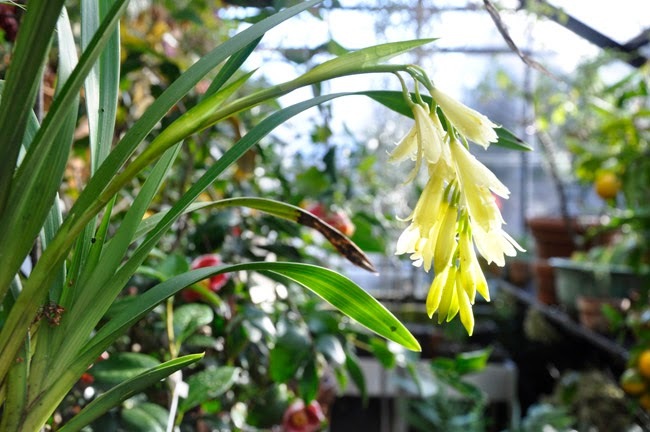 This species has a light fragrance, and pendant floral scapes when the plant is mature. 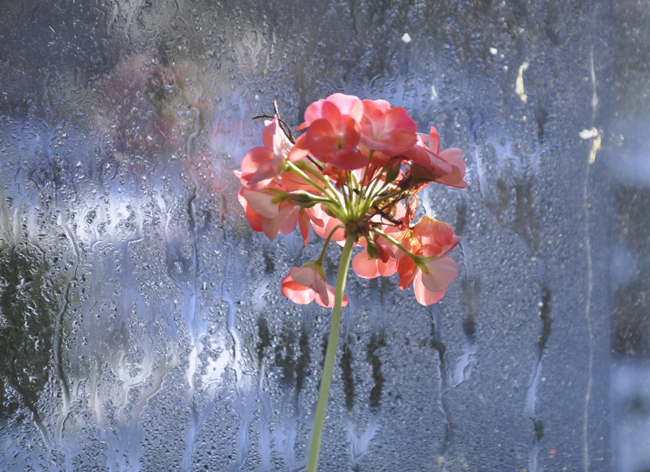 TO anyone who lives in a cold climate with a greenhouse, as freeze is inevitable. Why they always happen on the coldest night of the year is beyond me, but for what ever reason, the heater always blows up during an epic blizzard, glass breaks during an ice storm or it just plain runs out of fuel during an arctic vortex, as it did for us last year. 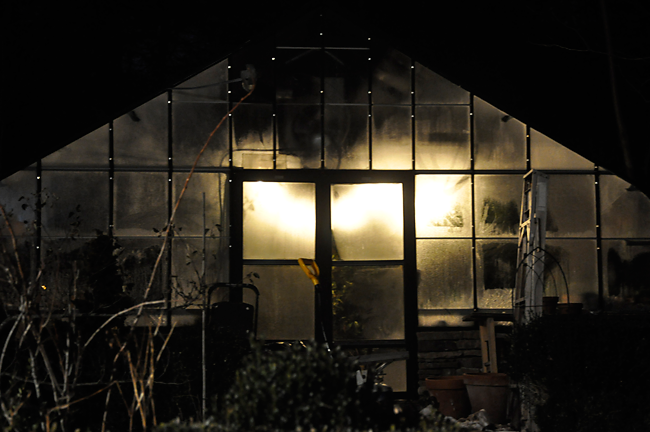 This morning, I awoke to temperatures which made the morning national news ( -6º without windchill), and when I looked out at the greenhouse at 5:00 am in the dark, I could see that it was completely white with frost - never a good sign. At 5:15 am, it didn't look good. 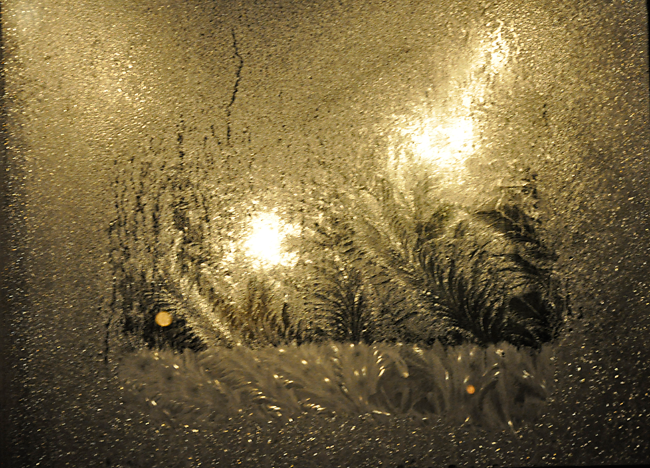 Single pane glass, tender plants and -5º just isn't a good mix. I gave up. I am not good with these sort of things. I mean, I am a realist, or a fatalist - regardless, I just turned and started to make my coffee, and then watched the weather for a bit, ignoring the facts since - well, there just isn't much I could do about it at this point. At least, that's how my head works. I was not about to run out and start hauling tender tropicals through -5º F weather as that would surely kill them, even in the short run to the warmer house. What was done, was done. I didn't real defeated, just a little 'done with it'. 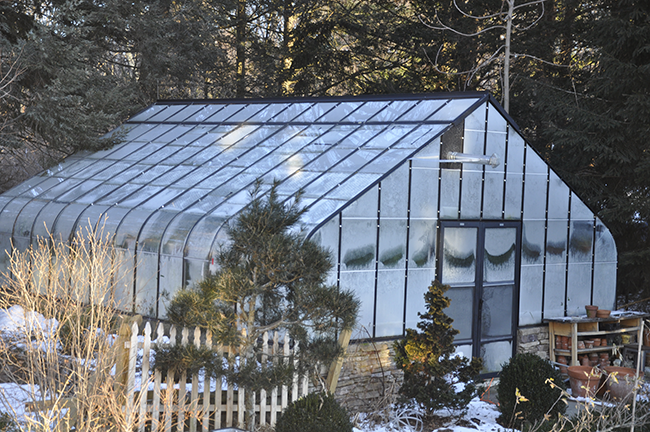 By sunrise, the entire greenhouse what covered in frost - never a good sign, as usually the glass is clear near the ridge. it looks like it is crying, doesn't it? By 7:00 am I stood in the kitchen with my coffee in my hand, stareing through the window looked to see if the furnace was perhaps on, and that due to the insanely cold weather, that for some strange meteorological reason, there was no steam emerging from the exhaust. 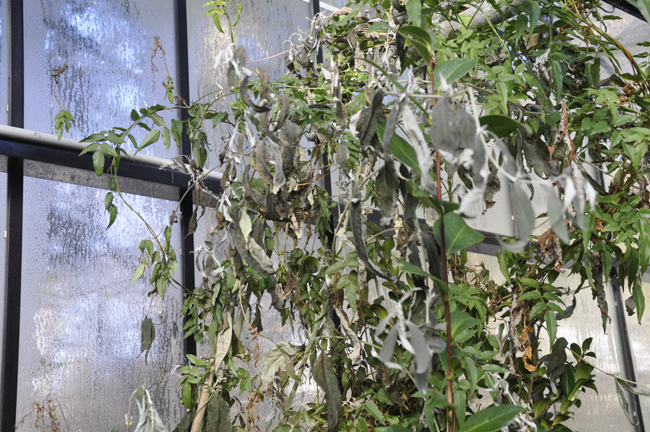 That inside that single pane glass house, all of the plants were indeed fine, and it was 70º and balmy. After about 17 minutes of standing there watching ( yes, it I timed it), reality began to sink in and all hopes for a miracle faded. These are the things that make keeping a greenhouse stressful - cold, frigid nights, running out of fuel - everyone who owns a greenhouse has their own horror stories of loosing everything, entire collections, plants that were collected from all over the world - and for me, a massive collection of plants which can sometimes seem like a burden, but at the same time, valuable and difficult to replace, many being in the collection for 15 years or more. Our Calla lilies suffered significan freeze damage, but I think that their roots are fine, and I am confidant that they will regenerate new growth once cut back. Thanks to Joe who woke up at that point, and ran out in his slippers, fiddling with the switches and thermostats, not all was lost - for he said that it was 20º in the greenhouse, the pots were just starting to freeze, and for some strange and magical reason, many of the plants looked fine, but the truth was that it was -5º outside, and the temperature was dropping quickly. 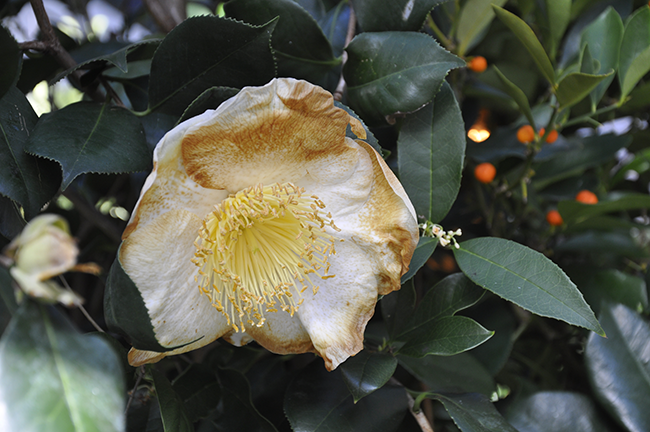 Camellias are very hardy, perhaps so hardy that I could grow them in the greenhouse planted in the ground without any heat at all, but the flowers on many get damaged easily. This Higo was frozen solid. We called our gas company ( Suburban Propane) who are now, I am convinced, the best guys out there, as they rushed out at analyzed the situation within an hour. In the mean time Joe made me run to Home Depot to buy a couple propane heathers that were 200,000 btu's and they were able to bring the greenhouse back to a balmy 75º. Our gas men analyzed the problem and felt that our furnace was broken, ordering a new part which may or may not be in stock, and the left. We waited, with our propane space heaters on, and the sunshine which helped rewarm the greenhouse. We had to move a few benches, many pots and tubs of plants in order to make way for the gas men who would be installing a new blower, and by noon everything was moved, and continued to wait. Many of the plants in the collection would not mind a good freeze, this Narcissus cantabricus was frozen crisp, but thawed out nicely in the January Sun. It is native to the high, alpine meadows in Morocco's Atlas mountains. While making lunch in the kitchen, I noticed steam emerging from the greenhouse, and thought that perhaps one of the heaters over-heated, but then I saw that the furnace had magically restarted. Strange. They lights too, had come on in the greenhouse, all of which are on separate electrical lines, but nothing was working earlier even though the meters that the gas men used told them that we did at least have power coming to the furnace. Velthiemias always surprise me - I was certain that I lost these this time, as the leaves were so frozen that they appeared transparent - like a head of iceberg lettuce that accidentally was placed in the freezer. 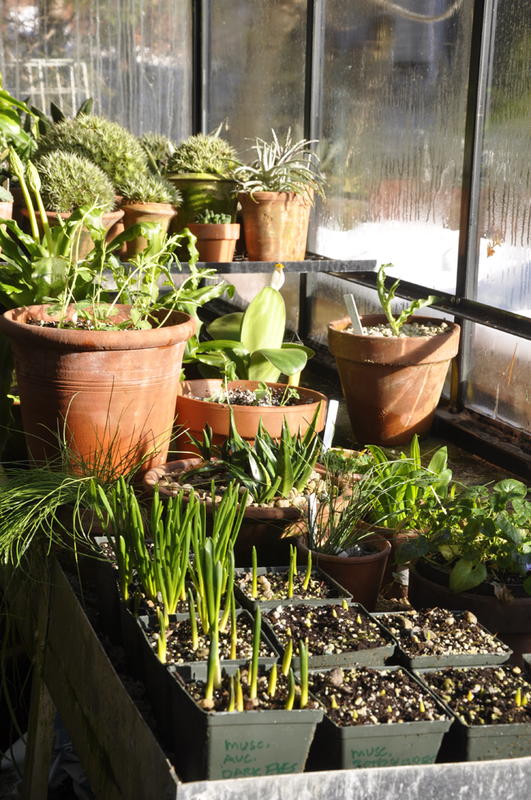 Once the sun thawed the greenhouse, they became green and alive again. Magic. This is becoming a long story which surely no one really wants to read, so I will shorten it. After finding an electrician who come come right away for an emergency call, and who thankfully travelled out from Boston just at dusk, ( Thanks so much James! You are AWESOME!) we discovered that the problem ( he discovered that the problem….) was just a plug which rusted, got wet and somehow triggered the furnace to short - or something like that, I clearly know nothing about electricity. 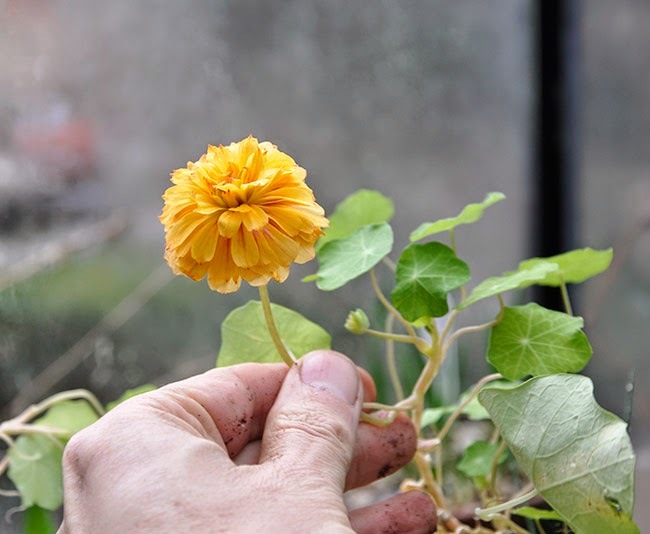 The tuberous tropeaeolum also survived the hard freeze, and these looked so tender and small, that I didn't even bother to carry the pot into the house. By the end of the day, they looked as they would have looked on a warm, day in May. 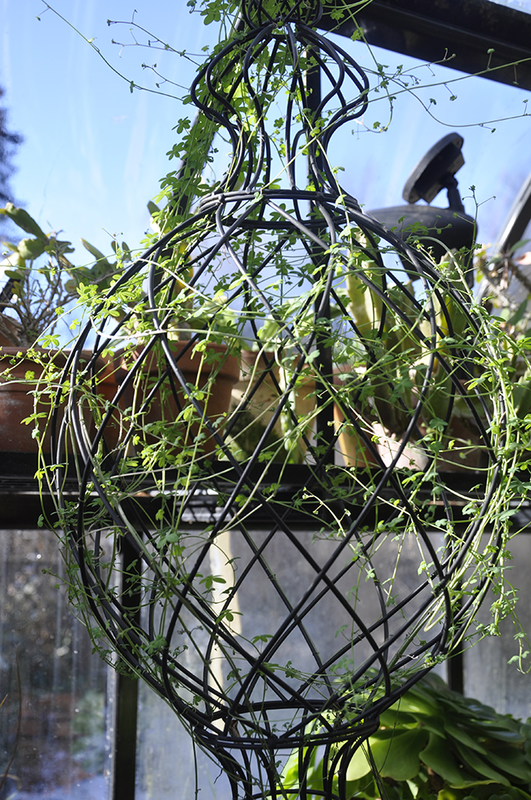 The surprising fact here is that it looks like most of the plants have survived, even though at 7:30 am the temperature inside the greenhouse was 18ºF. My greenhouse has frozen three times now, at least, frozen to low temperatures that were below 25º F, and each time I am so surprised to see how many plants survive, especially given that many plants freeze and die in a frost when outside. 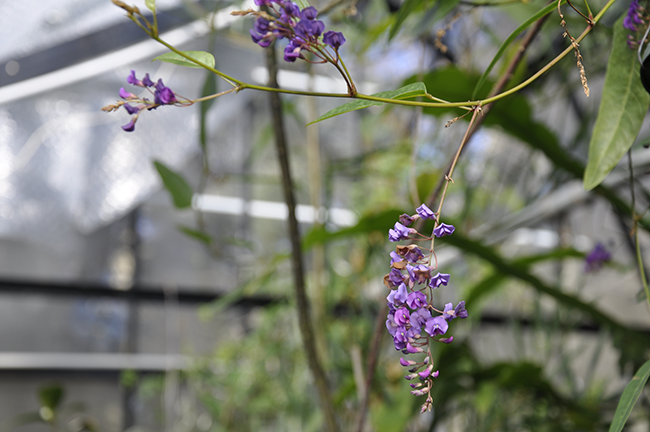 The reason so many survive is that most of the plants in the collection come from either areas of the world which experiences extreme temperatures, such as the deserts or alpine areas, or they come from South Africa, Chile, cold areas of China or New Zealand. 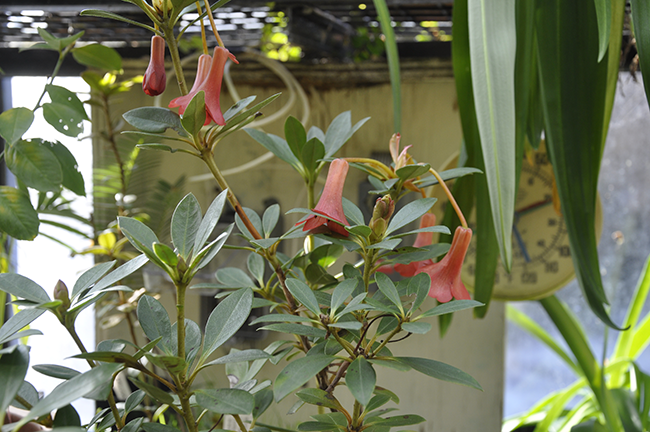 Some plants are native to cold altitudes, yet still from tropical climates. 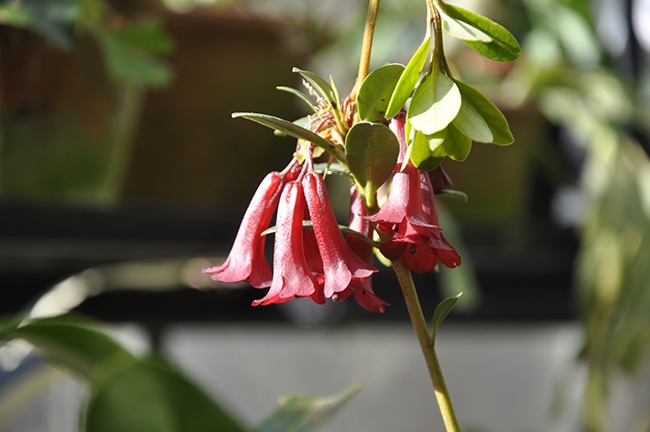 The Vireya are alpine forms of rhododendrons from Mount Kinabalu in Borneo - but they grow at such a high elevation that they can handle light frosts. Only the pedicels on these plants were damaged. 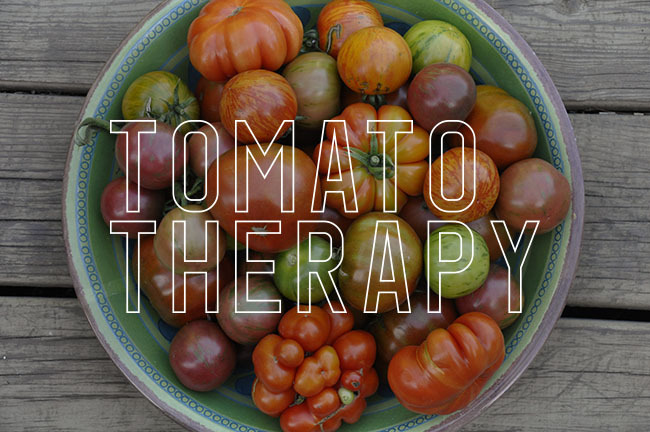 Plants are also kept somewhat dry, which helps the cells stretch a bit when a freeze happens. Amazingly, it appears that we only lost a handful of plants, and we are grateful to everyone who helped or offered to help haul plants into the house today. Thanks to Bob and his assistant from Suburban Propane in Rochdale Ma who drove out first thing, thanks to the ladies in the office there too - you deserve lots of chocolates! Many thanks to Glen Lord who stood by on call for most of the day offering to help us move everything into the house, as he has helped us before, and thanks to James Holske our new electrician who truly saved the day with his skills in sleuthing out what the problem was. This species of Vireya is more alpine in nature that most of my other forms, and the only damage appears to be frozen and wilted new, tender growth. The flowers were still fine. Australian vines like these hardenbergia violaceae came through with no damage at all - with many plants, as long as the roots or pots don't freeze, all is well. These are planted in the ground, which remained cold, but did not freeze. Succulents behave differently with frosts, most can handle such freezes well if they are dry, or wilted. This Aeonium was pulled out of its pot in October and just set on the ground, where I found it frozen solid with little hope of recovery, but it looked fine - no longer transparent and turgid again by nightfall. 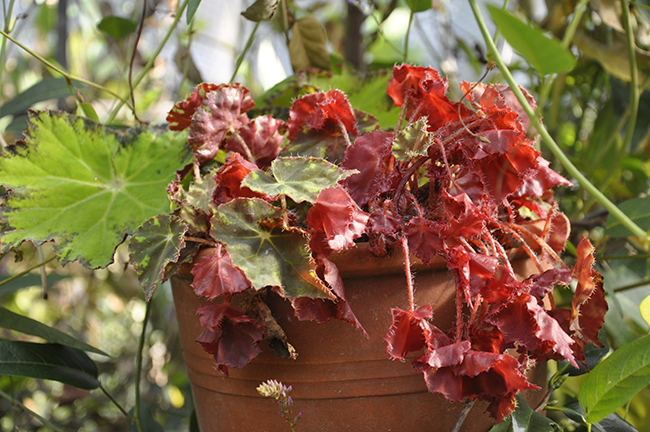 Begonias were another story, most suffered some damage, but many froze partially, with half of the plant wilted and the other half still alive. Whether they will all survive is yet to be discovered. I hate to share this all with you, but since many of you follow our dog's lives on this blog too, I am. Yesterday we were told that our sweet Fergus has cancer, and only has a little time to live with us. His lungs have nodules throughout them and it has spread to organs. He started coughing this weekend, yet appeared so healthy after some dental work two weeks ago. We have decided of course to not prolong any suffering and opted to not treat him other than with pain medication and some steroids. He is is super good Fergie spirits, full of energy and hungry, but coughing terribly at times. Today was a good day for him, no coughs which we feel was due to the steroids, but we've been told that it could be a matter of days or at best, a month or two. He is 12 years old, and surely a senior, but as many of you who have beloved pets, one is never really ever ready for this. He did chase a squirrel today.